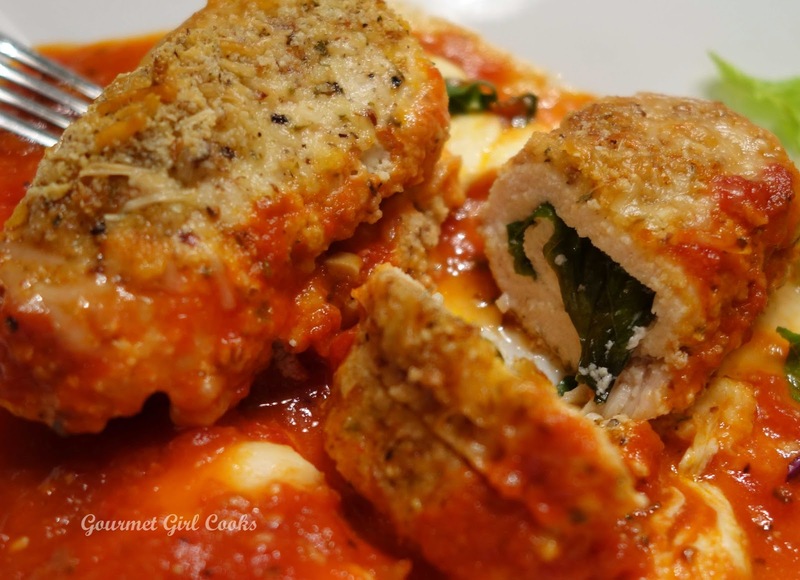 Gourmet Girl Cooks: String Cheese Chicken Roulade -- Simple "Grain-free Gourmet"
Preheat oven to 350 degrees F. Lightly grease a 1-1/2 quart Pyrex-type casserole dish with olive oil spray or oil. 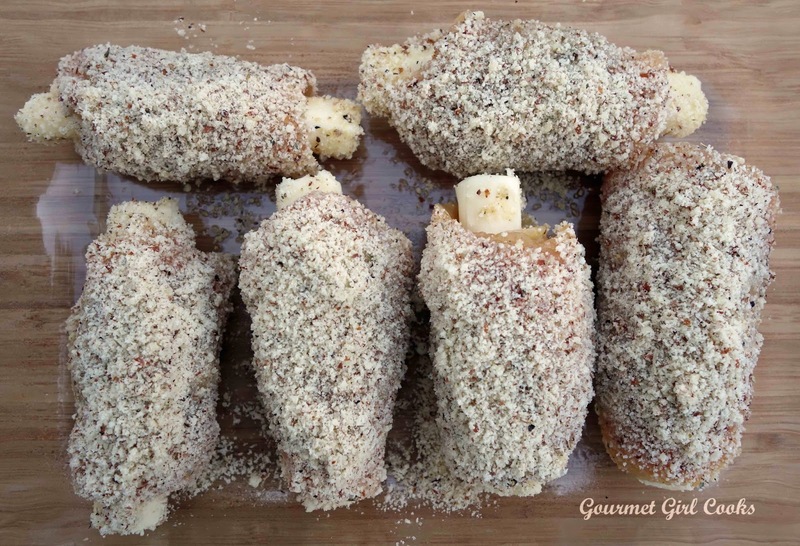 In a shallow bowl, combine almond flour, finely grated Parmesan, pepper, salt, and Italian seasoning. In a separate small bowl, beat egg with water and season with salt and pepper. 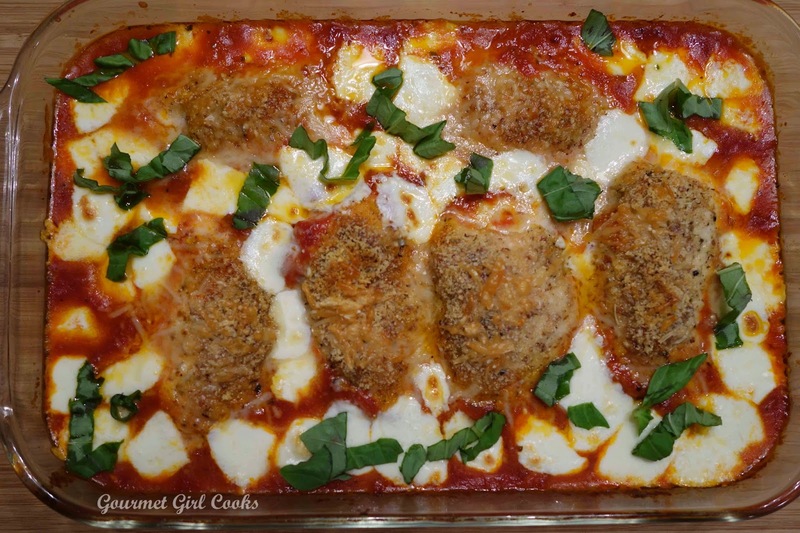 Lay chicken cutlets out on a cutting board or other flat surface. 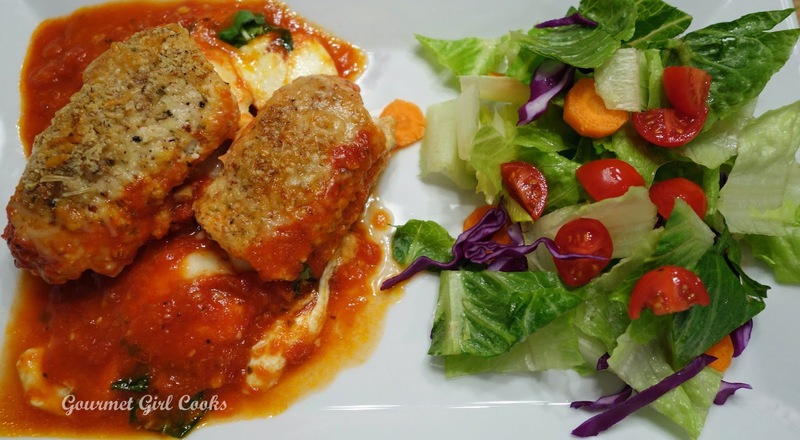 Place 1 large basil leaf in the center of each cutlet; place a piece of string cheese crosswise on top of each cutlet and roll up snugly around the string cheese. Gently dip rolled cutlets in egg wash, one at a time; and then roll in the seasoned crumb mixture until well coated. 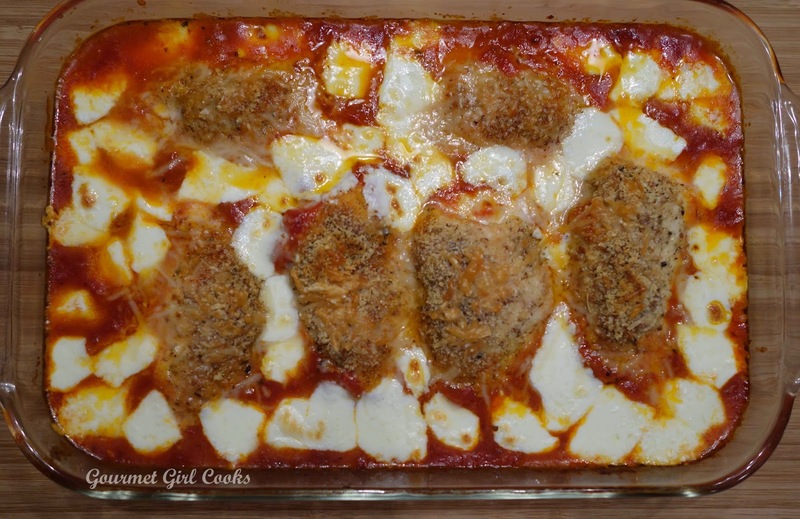 Place each cutlet seam side down in lightly greased baking dish. Bake for 18-20 minutes until lightly browned. 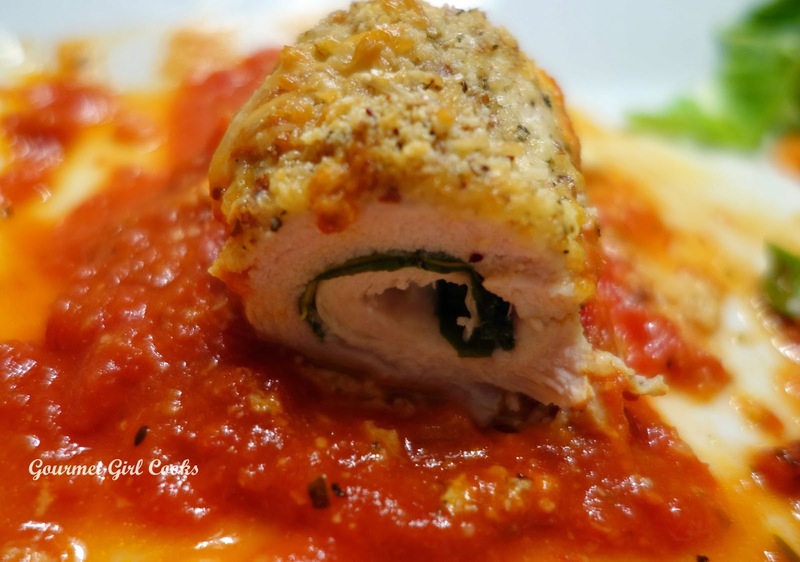 Remove from oven and spoon heated marinara sauce around chicken (do not add cold sauce to a hot casserole dish), leaving tops of chicken rolls exposed. Scatter diced fresh mozzarella on top; sprinkle tops of chicken rolls with shredded Parmesan cheese. Bake an additional 15-20 minutes, or until hot and bubbly. 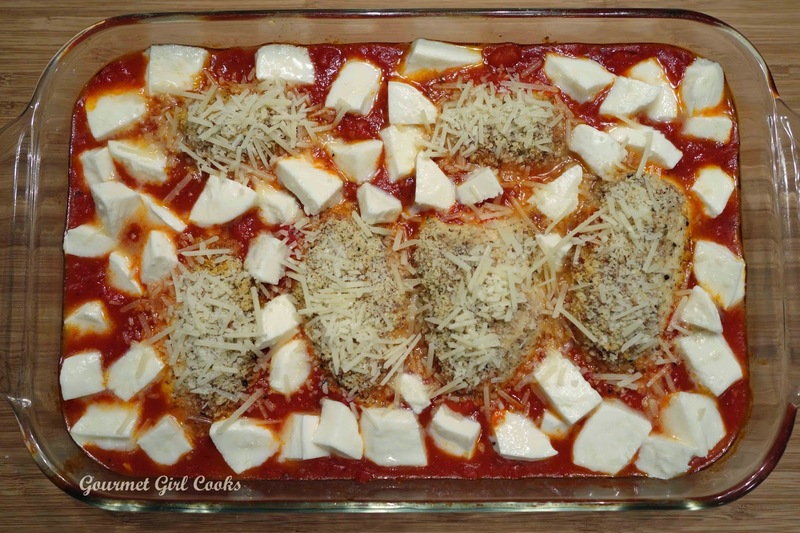 If desired, run under broiler for a few minutes to lightly brown cheese. Let sit for about 5 to 10 minutes so cheeses set. If desired, top with thinly sliced ribbons of fresh basil (chiffonade). Optional: Serve over julienned zucchini or yellow squash pasta, if desired. You know what this reminds me of? 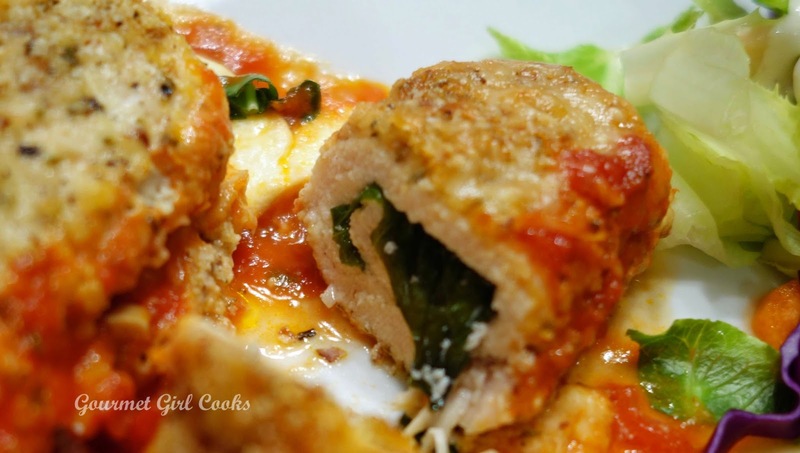 An Italian version of Chicken Cordon Bleu. 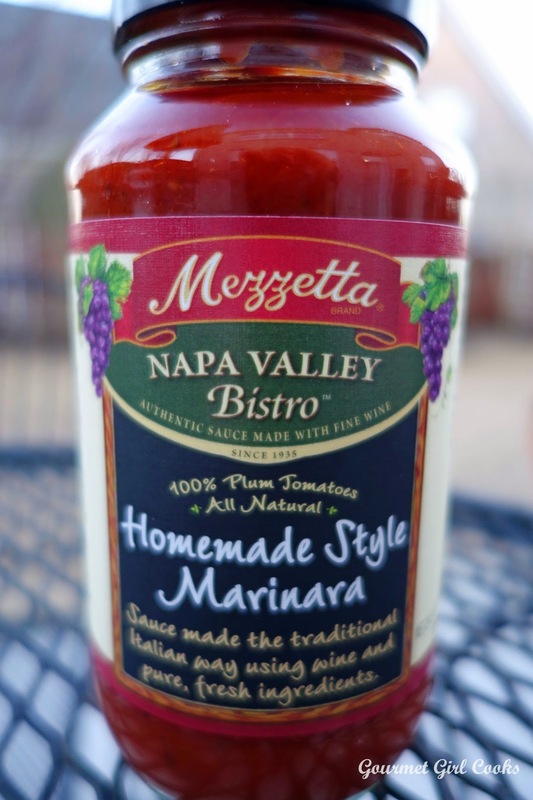 I love practically anything Italian! Wow, I haven't thought about chicken C.B. in ages! Hi CyberSis -- I hadn't thought about Chicken Cordon Bleu in a very long time either. But, you are right, it would be easy enough to do. "Springboard" is a word that reminds me of Graham Kerr I believe...didn't he use that term frequently? Just checked the recipe you sent a link to -- it looks REALLY good! 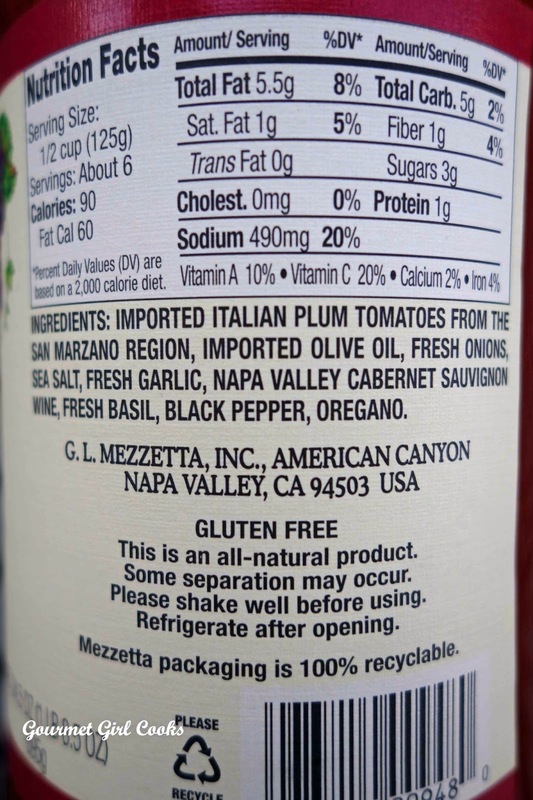 I wonder if it would be possible to bread it and then spritz it with olive oil and bake it (rather than browning in a pan)? I always have string cheese in my house with having small kids. I saw this and instantly thought GENIUS! going to make it tonight! I also saw you used Delgrosso's on a diff recipe. Im in PA and use Delgrosso's a lot!